Profile: High Beam is a no-nonsense soldier who always means business. His entire purpose in life is to hunt down and destroy Decepticons, and it is a purpose which he takes very seriously. Endlessly patient, he has been known to stake out his prey in parking lots or junkyards for weeks at a time. His propensity for clever plans and psychological warfare has led the other Autobots to come to believe that he's more brains than brawn. While it's true that High Beam would rather think his way out of a situation than fight his way thought it, he has never backed down from a challenge or a firefight, and his enemies have learned that it's unwise to cross him. High Beam knows his duty, and is all too eager to carry it out. Abilities: In race car mode, High Beam can reach a maximum speed of 450 mph. He is equipped with a vast array of high-end tracking and scanning equipment. He can pinpoint the location of specific targets as small as a digital watch battery, accurate to within a hundredth of an inch, from up to 20 miles away. In robot mode, he carries a spectral beam gun that produces a blinding, hypnotic strobe effect, rendering his targets unconscious for up to half an hour. He can also emit these beams through his headlights in vehicle mode. Weaknesses: High Beam is dangerously obsessive when it comes to locating his targets, often sacrificing his own safety in the doing. 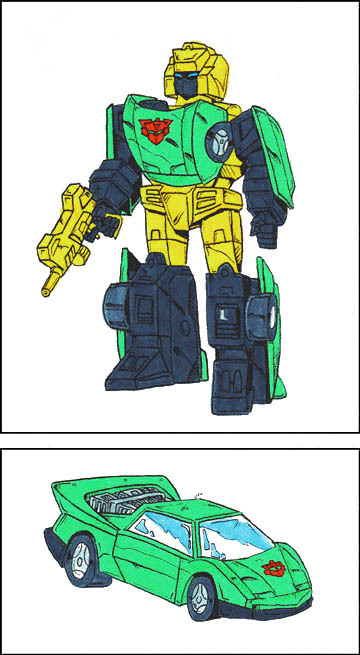 He has a particular vendetta against the Combaticons.